The 10th annual Native Treasures: Indian Arts Festival honors a couple of Placitas artists who share a transformative passion for their work, and one another. A January drive to the Placitas home studio of artists Joe and Althea Cajero provides the first stunning work of art I’ll see today: The afternoon sun casts a coralorange glow onto the imposing spine of the Sand?a Mountains, the crest made slightly opaque by the soft rise of pi?on smoke from adobes nestled into the valley below. 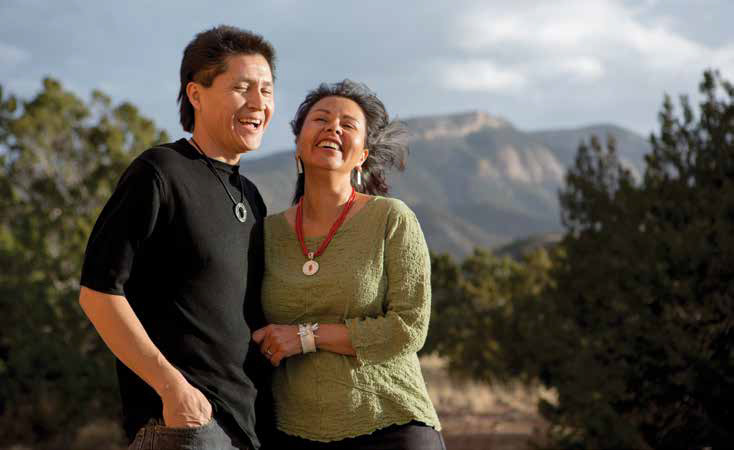 Joe, originally from Jemez Pueblo, is a sculptor who works in bronze and clay, and Althea (from Santo Domingo and Acoma Pueblos), crafts jewelry using cuttlefish bone castings. They’re busy preparing pieces for the 10th anniversary of the Native Treasures: Indian Arts Festival, which will take place in Santa Fe on Memorial Day weekend, May 24-25.